I'm writing today from a room in the ambulatory care department up at a hospital in Milwaukee. At the moment, my dad is in a suite a floor away getting a catscan, nothing serious. The procedure won't take long, but he needs to do an infusion after it is done to flush out all the dye, which will take about seven hours. As my mom is recovering from a leg injury, I volunteered to come up and be dad's companion for the day. When we left this morning before the sun rose, my mom suggested that Dad and I could use today to have some good bonding time. I said, "Hey, I volunteered to go with him, I didn't say anything about bonding." Then we laughed. All my time with Dad is bonding time, of course. Once we arrived up here and settled into his room for the day, I pulled out the iPad and keyboard and started to type, in fits and spurts. Dad asked what I was working on, and I said I was trying to think of something to write. I told him how I've committed to writing on this blog every day, but today, nothing was coming to me. He suggested that I write, "I'm at the hospital, looking at my dad, let me tell you how good-looking he is." 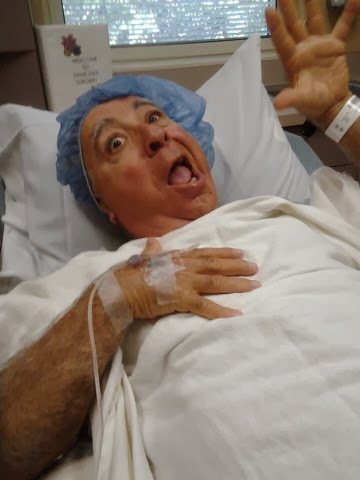 If he can be that entertaining when going in for surgery, just think how hilarious he can be for a simple outpatient procedure. When he gets back from his scan, and is hooked back to his IV, I'll fetch him some breakfast and lunch, we'll turn on the TV, and will probably just chill out. We'll chat occasionally, but we'll be quiet, too. When staff members come in, we'll both joke with them. The thing is, as much as we tease Dad for being friendly and silly with people, I am now exactly the same way. Mike sometimes calls me Rogerina (dad's name is Roger), particularly when we show up at a store or restaurant, the staff remembers me, and we get great service. Being friendly and silly is a fun way to go through life, and I don't need a day in the hospital with Dad to know that showing me how to have fun every day is one the best lessons he ever taught me. I'll take the refresher course, though, every time. Your Dad is awesome. However I've seen you make that same face in the early 2000's at some ungodly hour, probably wearing a cheese-head. I'm so glad Roger was able to pass his traits to you. Your smile lights up the room, your laugh is infectious…I can hear it now actually. You are blessed.